What exactly does the box mean with this 1,000 hour lifetime? This is the bulb’s Average Rated Life (ARL) — it’s the length of time for 50% of an initial sample of bulbs to fail (abbreviated B50). 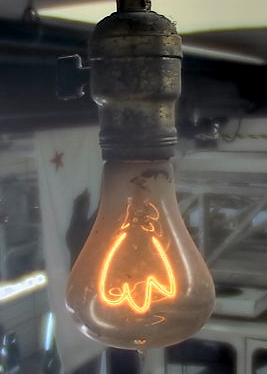 What “failure” means depends on the type of bulb; we’ll explore this in more depth later on. The definition of B50 reveals a common misinterpretation, namely that a bulb will last for its rated lifetime. In reality, only half of them last that long, although this rating doesn’t tell you anything about the distribution of failures around the median lifetime. 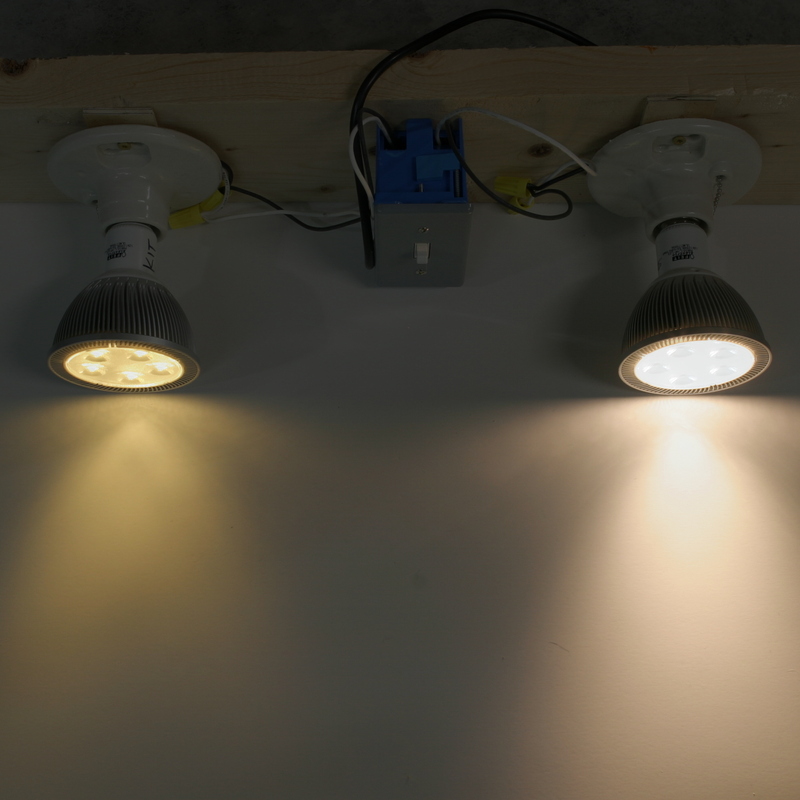 Left-to-right: Teardown of GE 7,500 hour “Basic”, GE 15,000 hour “Classic”, and 25,000-hour Cree A19 LED bulbs. GE Basic A19 Bulb uses a circuit straight from the SM2082D datasheet. 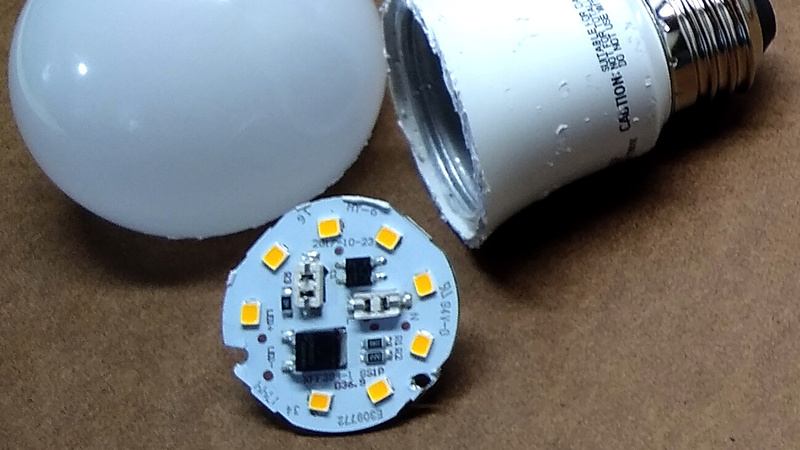 This GE bulb has a plastic dome covering a circular aluminum PCB which carries eight LED packages and the driver electronics. The driver consists of an MB10F bridge rectifier, an electrolytic capacitor rated for 105 °C, and an SM2082D linear constant-current driver. There are three resistors on the PCB: one bleeds charge from the capacitor when the bulb is off, and two others set the SM2082D current to 54 mA. In fact, the circuit looks like it was taken directly from the SM2082D datasheet. When they say classic, they mean it. This bulb is in a glass envelope just like incandescents, and like those old bulbs, the glass is easily removed with a ball-peen hammer. In place of the tungsten filament is an aluminum PCB folded into a squat obelisk. Sixteen 3.5 x 2.8 mm LED packages are connected in series on the board, with each one showing a forward voltage of around 9 V at 50 mA. So, this version has 48 LED chips vs 45 for the Basic bulb, except they’re in twice as many packages – this is good for keeping the LEDs cool. The Cree bulb has a diffused plastic dome like the GE Basic model. Inside, a larger aluminum PCB holds (16) 3.5 x 2.8 mm LED packages. Each LEDs drops around 8.5 V at 50 mA, so they contain 3 chips; like the GE Classic bulb, this one uses 48 total LED dice. 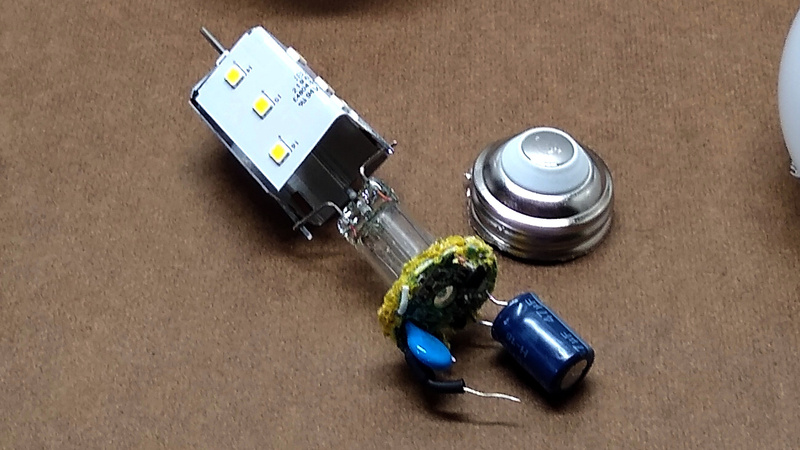 The LEDs are wired as eight sections of two paralleled LEDs, so the total drop is around 68 V. The LED PCB is coupled to a thick aluminum heat sink with silicone thermal compound. As it turns out, lumen depreciation happens to incandescent bulbs, too. By the end of their 1,000 hour life, the output has typically dropped 10-15%, but nobody ever notices. With LEDs, the effect is much worse, and the output continues to fall as the device ages. 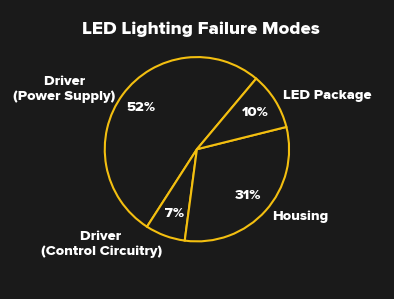 At some point, the LED is no longer producing enough light to fulfill its original purpose, even though it hasn’t “burned out.” Research says that most users won’t notice a gradual 30% drop in light levels; accordingly the industry has defined L70, the time at which the output has dropped to 70% of its initial level, as an endpoint for measuring LED bulb lifetime. Based on how it’s estimated, this measure is typically stated as B50-L70, the point at which 50% of an initial sample of bulbs will retain 70% of their rated output. Heavily-used LED bulb (left) vs seldom-used bulb (right) after 8+ years. This bulb has burned for over 1 million hours. I installed ~40 Mi-Light RGB CCT mr 16 bulbs in my atelier. Some came with bad reception of the control signal (2.4 GHz but not wifi). I programmed them in proper groups, having rgb and two whites is the simply amazing, you can have good fitting white for working and colorful ambient for fun. The reception is not the best and you need the repeat the command quite often for all lamps to adjust, so it does not work as a DMX replacement. However, setting the basic ambient lighting with those is the best bang for the buck. It sounds like DMX over 433 MHz or 2.4 GHz ought to be the answer. But then I guess you’d have to make your own light bulbs. With imported components such as the Samsung LM561 LED, we manufacture the product in house in Cleveland Ohio. All LED bulbs that I bothered too debug when they failed had a broken LED driver, LEDs were still fine. Might be a while until we get cheap reliable heat resistant AC-DC LED drivers. Obviously you have never experienced life under Socialism. Oh well I knew this would happen so I bought several cases of the older style bulbs. Engineered failures are not confined to electronics. Years ago I was the electronics team member of a new printing press development. At one time there was a meeting at which programmed failures were discussed – so as to increase maintenance profits. Various options were discussed and finally it was decided to cause a mechanical part to fail as the cost of replacing the electronics was small and lacked profit. One old engineer suggested a spring, in the heart of the machine, be designed to fail. This intrigued me, being able to to cause a simple component to fail. The engineer requested I choose a spring failure time, measured in operations. I chose 12,000 compressions. Off the engineer went and designed a simple spring, which was placed in a testing machine. The specification the spring must survive 12, 000 operations but fail before 15, 000 compressions. The test was run and the spring failed at 13, 978 cycles. 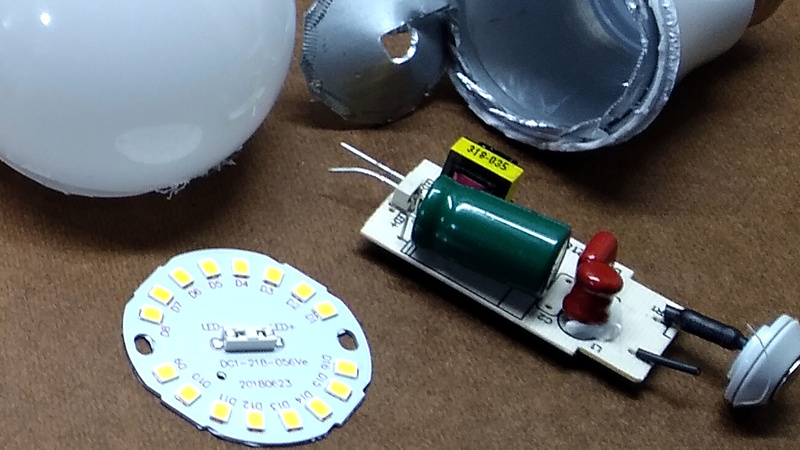 A couple other items that affect LED lamp life. You will see on some packages “Not Suitable for Fully Enclosed Fixtures” or vis versa. I’d say that a typical lamp installed in a ceiling fan with the glass shroud falls under fully enclosed. Basically the heat has no place to go and burns out the driver. Also I’ve seen some LEDs note the orientation of the lamp, screw base up or down, again, which way is better to dissipate heat. LEDs are much cooler that you thought..